A great deal of emphasis is being put on the importance of helping children make the transition between primary and secondary school and the changes that they will face on the journey to their new school. We have developed resources for schools to highlight the importance of road safety skills and journey planning to students moving up from Primary to Secondary School. Students in this age group are particularly vulnerable to pedestrian road casualties. 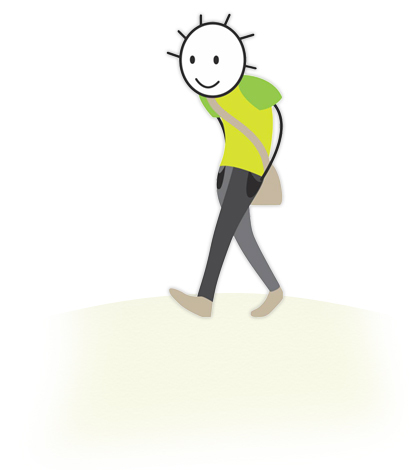 This resource, ‘New Journey’, aims to draw attention to issues facing these young people and provides road safety advice, guidance and also emphasises the importance of journey planning and how to make that journey less harmful to the environment. New School, New Choices is an interactive CD based curriculum resource for year 6 and is part of the New Journey programme. It is comprised of two PowerPoint lessons, each one lasts up to an hour covering; 1) Road Safety (27 slides); and 2) Journey Planning and its potential affects on the environment (23 slides). Making Tracks is a pedestrian training scheme specifically for Year 6 students, which aims to develop their awareness of roads and traffic, enabling them to travel more safely to secondary school and beyond. It has been influenced by the Footsteps Pedestrian Training programme. Making Tracks is best used in conjunction with the New School, New Choices transition lesson, although it can be used independently.